Over the past two weeks the world has been treated to amazing displays of physical achievement as each country’s greatest athletes have gathered in London in pursuit of being “faster, higher, and stronger.” While we recognize individuals for their accomplishments at the 2012 Summer Olympic Games, the African concept of ubuntu is at the core of every athlete reaching his or her dream. 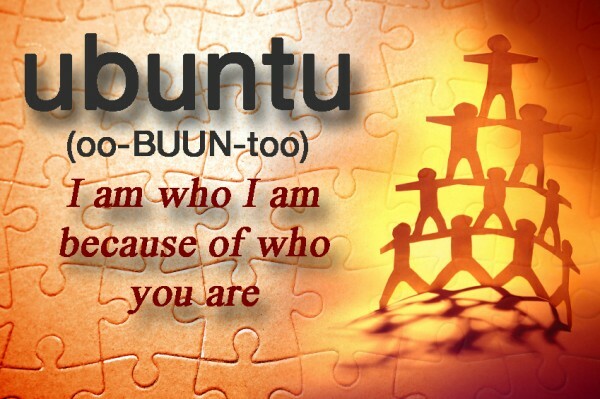 Ubuntu is the African philosophy that emphasizes the inter-connectedness of all persons. There is no clear English equivalent; the concept is often translated as “I am who I am, because of who you are.” Both Nelson Mandela and Archbishop Desmond Tutu have used the term to describe how injustice to any one group of people impacts all people. But the inter-relations apply not only to suffering, but also to celebration. It does not diminish the talent, commitment and accomplishment of an individual; it acknowledges the importance of others in the journey. No person rises to the pinnacle of success without being lifted by others. When Michael Phelps won his record breaking 19th medal, he was quick to give credit to the members of the relay team. As his medal tally grew while his career drew towards its finale, he consistently acknowledged his mother, family and Coach Bob Bowman, all of whom have been been with him throughout his journey. Ubuntu! I am who I am because of who you are. In the midst of Usain Bolt proclaiming himself the fastest man on the planet and a living legend, he acknowledged the importance of his country’s support and having training partners such as Yohan Blake to push him to new heights of performance. Ubuntu! I am who I am because of who you are. The interconnectedness also encompasses pain and tragedy woven into the fabric of one’s life. US Olympian Kelly Wells found personal refuge from an abusive stepfather by pouring herself into training on the track. Her youth was marked by tragedy, yet she is now a model of resilience and a beacon for others who may be facing the challenges of abuse. Ubuntu! I am who I am because of who you are. Over the past two years I’ve had the privilege of working with Team Elite of SwimMAC of the Carolinas, arguably the top swim club in the US after having the largest number of athletes qualifying for the Olympic trials and placing more swimmers on the Olympic squad than any other swim team in the country, plus having SwimMAC CEO and Team Elite Coach David Marsh named to the US Olympic coaching staff. The five Team Elite swimmers in London are returning with six medals — 3 gold and 3 silver. All five are exceptional athletes; yet their character and integrity are even more impressive than their physical abilities. These five athletes have held the spotlight, and while doing so have modeled ubuntu by reflecting attention to others as integral to their success. Gold and silver medalist Cullen Jones has long acknowledged the role that both of his parents and his nearly drowning as a child have played in his becoming a two-time Olympian. When he qualified for the 100 freestyle at the 2012 US Olympics Trials, his first action upon leaving the water was to hug Coach David Marsh and Assistant Coach Peter Verhoef. In an interview immediately after winning the 50 freestyle at the Trials, he was asked how he was such a different swimmer from four years earlier when he did not qualify for the event. He credited Marsh pushing him and having great training partners, Nick Brunelli and Josh Schneider. Ubuntu! I am who I am because of who you are. In preparation for winning his gold and silver medals, world record holder Nick Thoman would start practice with a handshake with now-Olympian Davis Tarwater as a commitment to push each other to excellence. Throughout interviews this past year, Thoman acknowledged the role of the coaches, support staff and training partners such as Eugene Godsoe and Nelson Westby, as well as the incredible field of US athletes competing in the 100 backstroke, as vital factors in preparing to represent the US in London. Ubuntu! I am who I am because of who you are. Gold medalist Davis Tarwater has stated that failing to make the 2008 Olympic team was probably the most devastating experience of his life; and at the same time, probably the best thing that ever happened to him as a person. He coupled an evolved perspective with incredible work ethic in his quest for the 2012 Olympics, embracing challenges from teammates such as US National Champion Tim Phillips along the way. Ubuntu! I am who I am because of who you are. Three-time Olympian, Kara Lynn Joyce came to Team Elite less than 12 weeks prior to the Olympic trials, in part, to train head to head with Team Elite sprinters Madison Kennedy and Andrea Georoff. Changing programs so close to the trials was a gamble that paid off as she qualified for London in the women’s 50 free. Ubuntu! I am who I am because of who you are. The normally quiet and shy Micah Lawrence was clear and emphatic in her gratitude to teammates during a Team Elite meeting prior to her qualifying in the 200 meter breaststroke. She thanked not only Kevin Swander and Elliot Keefer, who both challenged and supported her in daily practice; but also those whose support and commitment created a sense of family that allowed her to strive for new heights. Kate Mills, Eric Knight, Bryan Lundquist, Greg Pearsall, and the entire SwimMAC community were all essential ingredients of this recipe for success. Ubuntu! I am who I am because of who you are. On a personal note, my professional colleagues are aware that I have had the honor of working with Coach David Marsh, Team Elite and the SwimMAC community. In the aftermath of these 2012 Olympic Games, I find that my reputation, recognition and influence as a performance psychologist has grown. Thank you, Team Elite, for the privilege of working together. Ubuntu! I am who I am because of who you are. Congratulations to Nick Thoman, who has now earned at spot on the 2012 US Olympic team! Here’s a portion of an interview with Gold Medalist Mel Stewart of SwimSwamTV in which Nick discusses his mental preparation for the Olympic Trials. The interview was conducted at the 2012 Charlotte UltraSwim. Check out SwimSwam.com for more information, video and news of the swimming world, and SwimOutlet.com who sponsored the video. BTW, Nick, thanks for the endorsement!